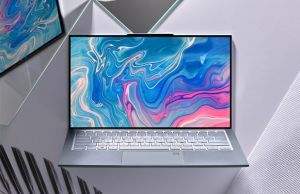 With Intel Broadwell hardware just a few months from hitting the stores, Asus announced the Zenbook UX305 line at IFA Berlin, a device that promises to be one of the slimmest 13.3 inch laptops ever created and at the same time, one of the lightest. 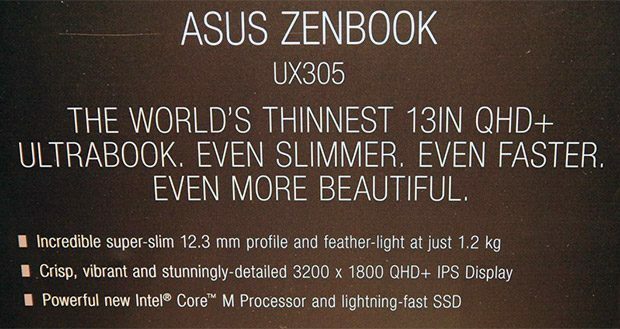 My full review of the Zenbook UX305 is available over here. Check it out. In this post I’ve gathered all the available info on the UX305 series, including specs, pictures and details on various features, prices and the release date. The UX305 will supposedly have a 12.3 mm body and based on how Asus usually measure their devices, that’s excluding the rubber feet. 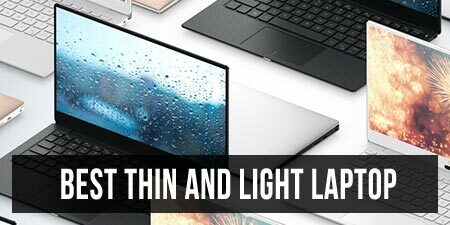 For comparison, their previous Zenbook UX301LA top-of-the line ultrabook was 15.5 mm thick, so this new model shoves off a few millimeters from its height. Now, that’s not necessarily going to make a big difference in everyday use, but the UX305 is also lighter than the UX301LA, tipping the scales at 1.2 kilos ( 2.65 lbs), while the UX301LA weighs 3.1 lbs. And this part is actually important, as I can get used with a slightly thicker device, but really appreciate the every bit of ounce dropped. Update: My full review of the Zenbook UX305 is available over here. Check it out. Update2: The Zenbook UX305FA is now available in the US for $699 and that kind of money gets you an excellent configuration with a Core M-5Y10 processor, 8 GB of RAM, a 256 GB SSD and a FHD matte display. Follow this link for more details. 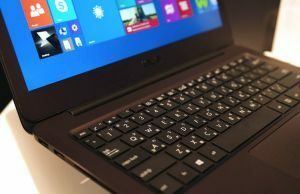 Update3: Asus released the Zenbook UX305CA in the meantime, an updated version of the UX305FA, with Skylake Core M processors, that promises to improve performance and battery life, while keeping prices at bay. At the same time the UX305 seems to have pretty much the same footprint as the UX301, based on the specs list above and the size of the bezel around its 13.3 inch display. 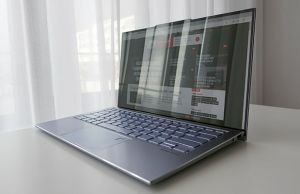 You’ll find a few pictures and videos included in this post that should show you what to expect from the UX305 Zenbook. 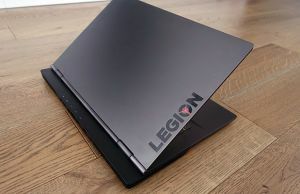 It will be available in two different colors (“Obsidian Stone” or “Ceramic Alloy”, or some sort of dark-grey and white) and it does look pretty sleek, keeping the familiar lines of the Zenbooks, with the concentric circles pattern on the lid cover and beveled sides on the darker finishing, but chromed elements on the white one. 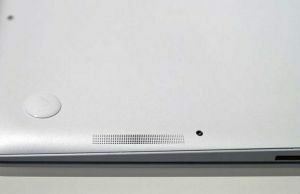 There’s no glass on the hood or on the interior like on the UX301LA, which is good news, for a number of reasons (easier and cheaper to manufacture an aluminum shell, less prone to fingerprints). And you can see for the pictures that the Obsidian Stone version of the UX305 is going to show smudges quite easily, which should not be a problem on the white model. 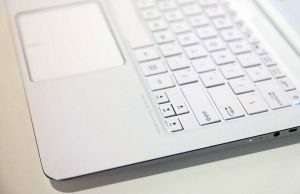 At the same time the UX305 seems to pack a marginally larger trackpad than the other Zenbooks before and a similar backlit keyboard (latest info show that the UX305 is not going to offer a backlit keyboard), painted in the same color as the inner body, so again, Asus does not care about contrast. 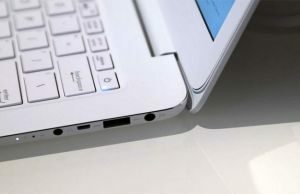 Besides that, I’m seeing 3 USB ports on these laptops, a card-reader and a micro-USB slot on the sides, but Asus will probably include some adapters as well. There’s no miniDP port though, which can be problematic in you plan to connect a high resolution screen to this computer. The UX305 is not only a new device on the outside, it also packs fresh goodies on the inside, with the Broadwell Core-M hardware being the biggest novelty here and promising fast performance and long battery life (you should expect up to 10 Hours from this one, according to Asus). Chippy at UMPCportal sheds more light on the hardware specs and one version of the UX305 will include the Intel Core-M 5Y10a processor with 4 GB of RAM. That’s probably going to be a base level configuration. 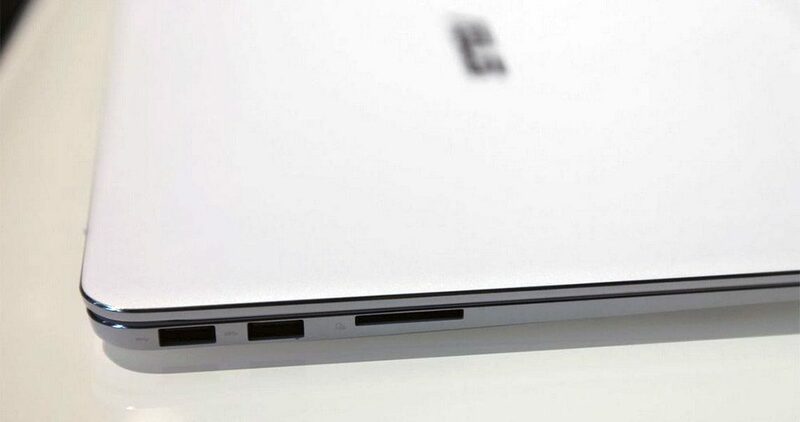 At the same time, he report there’s going to be a 45 Wh battery inside this laptop, slightly smaller than on the UX301LA, but hopefully enough to deliver on those 10 hours promised (or at least 7-8 of actual real-life use). Keep in mind that the Core-M is the low-power version of the Broadwell line and a successor of the Core-Y series, thus it’s not going to be very powerful and will only be available on the thinnest designs. Chances are most of them will be fanless, I can’t confirm if that’s the case for the UX305 or not (Update: It is, and a more detailed list of fanless ultrapotables is also available here). There are cooling grills hidden behind the hinge, but that does not prove anything, Asus might offer distinct configurations for this one and some of them could indeed require no active cooling. I’m not a IFA this year, so I must thank Lars from allaboutsamsung.de for the pictures above. There’s also a sharp 3200 x 1800 px screen on this laptop, which again I’m not necessarily a big fan of, especially if it uses the same panel as the Zenbook UX303 or the Lenovo Yoga 2 Pro, known for its annoying color problems. Hopefully its a different panel or at least Asus will address the color issues by the time the Zenbook UX305 gets in stores. It’s also worth noting that the models showcased at IFA came with a matte screen, but if I’d were to guess, the final units will mostly get touchscreens. Still, who knows, maybe Asus will have some versions with matte displays as well, I know there are plenty of users who would appreciate them, me included. The specs also mention a 1920 x 1080 px screen option, so we do know that Asus plans on offering at least two display types for the UX305. 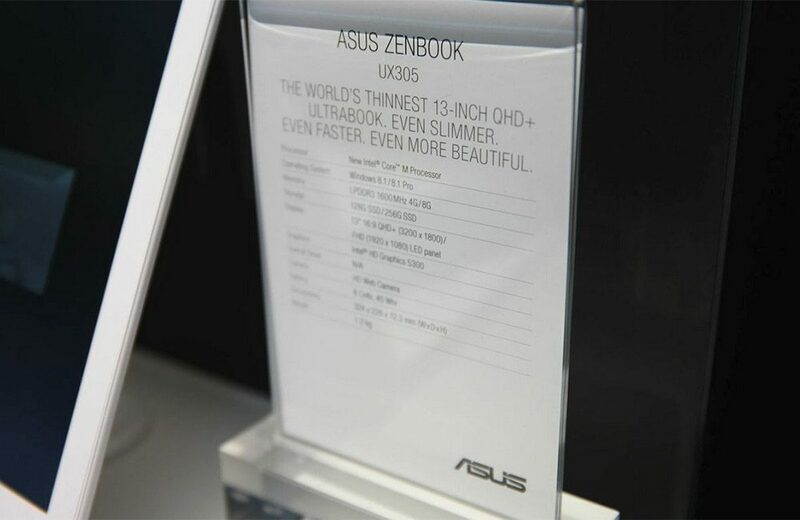 Of course, the Zenbook UX305 won’t be available in stores just yet. I don’t have exact details on a launch date or prices for the time being, but don’t expect this sooner than the end of the year, probably in November/December. 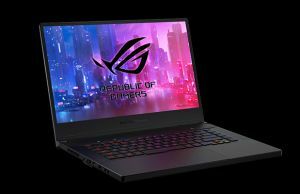 Hopefully this will be more aggressive priced than the UX301LA line and at the same time I do hope Asus will actually deliver it worldwide and on time, not like with the UX301LA series last year or the UX303 right now, which continues to be delayed. Update: The Zenbook UX305 is going to start at 799E over here in Europe, so pretty much around $800 bucks in the US, with higher end (and thus pricier) configurations available as well. Should hit the stores in early November, if there are no delays. Update2: My full review of the Zenbook UX305 is available over here. Check it out. Anyway, I’ll keep my eyes peeled for any insights on the Asus Zenbook UX305 though and I will update this post once I find anything worth sharing, so stay tuned. Asus is following the same marketing strategy that contributed to the fall of Nokia. You shouldn’t announce successor models to products that are only now being released. Asus UX305 probably won’t be available properly worldwide until January, which is nearly half a year from now. 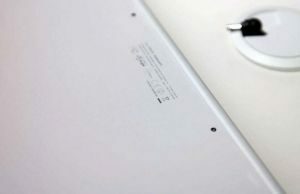 The UX303 is just starting to hit the stores at the moment so it is not wise to announce its successor model already. I don’t think this is a competitor for the UX303, that’s slightly larger and heavier, but at the same time more affordable. This will be a higher-end device, for sure more expensive and I look at it more like a follow-up for the UX301LA line. Asus is full of it!! They announce so many “new” products way ahead of availability!! They are shooting themselves in the foot! People will not wait that long, they will get frustrated and go somewhere else! You don’t think that I will buy a UX303 (if available, what a joke) when they tell me a UX305 is coming out soon!! This strategy might work for low priced items under $300 but if I am going to invest $2000 I am not going to buy a UX303 and then few months later be outdated by a UX305!! Totally stupid marketing strategy that didn’t work for many items including cameras!! Car mfgs do not do it anymore!! Asus, please listen to your customers they are your MOST VALUABLE assets!! I agree. But just to be clear, the UX305 is not a competitor for the UX303, since it’s based on a Core M platform. A follow up for the UX303 with Broadwell U hardware should be available in Q2 2015, thus probably launched earlier. 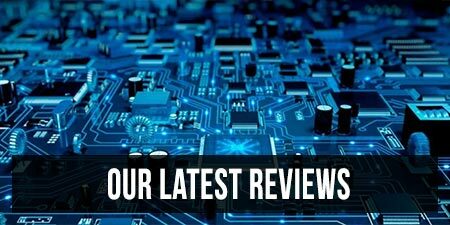 If you get a review unit would you consider trying a live USB to see how it handles Linux? I like what I am seeing but I have no intention of leaving Windows on the SSD. I would really appreciate if you could check. I tried searching if Linux even supports the Core M series but no luck. Looking forward to your review of UX305 run Linux. I don’t think there’s much to worry about, Intel is pretty awesome when it comes to Linux support. Haswell was supported in the stable Linux kernel even before it was actually released, and patches for Broadwell have been flowing in Linux for quite some time too. Of course it won’t be perfect on day one performance-wise, but it will be supported. Ubuntu 14.10 will ship with the 3.16 kernel if I’m not mistaken, and that should be good CPU-wise for the Zenbook UX305. 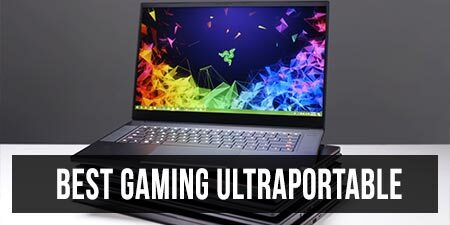 Then again, most Laptops have small issues with Linux, and it will be good to see how this one runs, but I’m quite optimistic when it comes to Asus laptops, never had big issues using Linux on these. 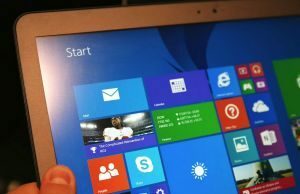 With 12.04 / 14.04 everything worked out of the box with my asus ux302a – perfect! You’d think instead of pushing out more products they’d focus on shipping and fixing the ones already out. The 303 line has been an utter nightmare. 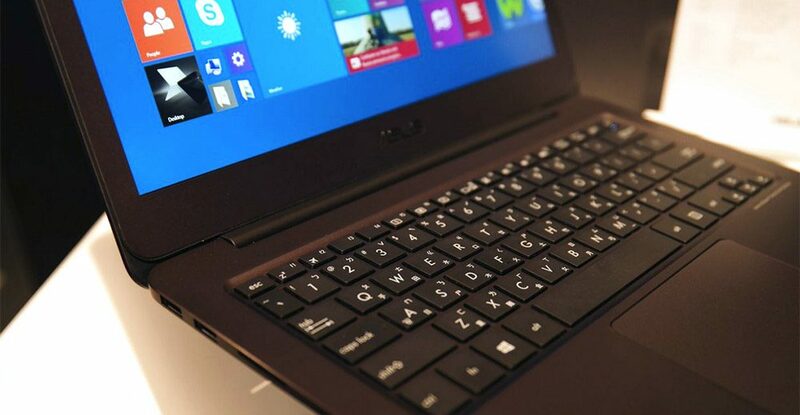 i hope there will be version that have a dedicated graphic card on this brand new zenbook ultrabook. and they fix cooling and yellow issue that already on ux303LN current version. 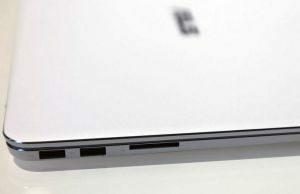 I don’t think they’ll have dedicated graphics on this thin laptop, but a follow-up for the UX303 will surely be launched in 2015. Do you think it is worth to wait for it, Andrei? 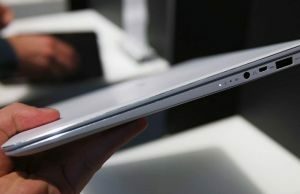 I’m thinking about UX303LN or Macbook pro retina (13″). What are you thinking about Intel hd 5300? However the most important point here is battery life. There’s always going to be a next best thing so if something that’s already available TODAY checks the right boxes for you, my advice is to get it. If not, wait. Can’t say much about the HD 5300 graphics, I’ll have to wait to see it in action before drawing any conclusions. 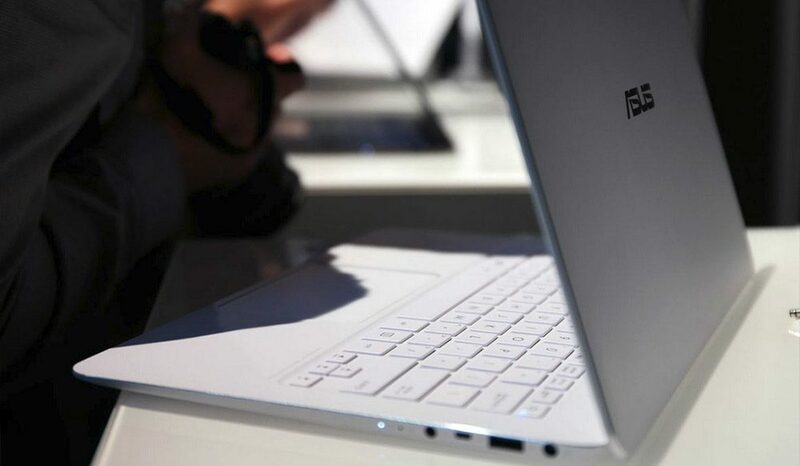 Battery life is announced to get even better with Broadwell laptops, however, there’s a catch. Broadwell Core M chips seem to run at a lower frequency in order to save energy, but I’m not yet sure what’s going to happen when actually performing daily activities on a Broadwell computer and if the hardware is going to be more efficient in this case or not. I hope it will, but again, I’m waiting to test it first. Could you maybe compare this to the UX303? Do you think it’s worth waiting for the UX305 or should I buy the UX303 when it’s finally out here? How is the performance compared to this? And do you think it will be more expensive? Yes, I’m pretty sure it will be more expensive. Other from that, it’s too early to compare it to anything, I don’t know what to expect from the Broadwell chips yet and I won’t jump to any conclusions before I actually get to test it. Is it possible to upgrade the haswell on the 303LN to a broadwell? I ordered a UX301LA (top model, 512GB SSD and so on) about 10 hours ago. At first when I saw this announcement I was like “hmm maybe I should cancel the order” but then I realized that this won’t get in store before my college quarter ends lol. 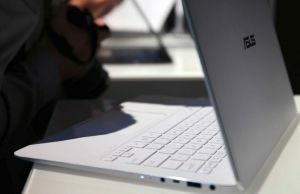 However, what I also realized after read this article is that this new Zenbook is not near the UX301LA when it comes to performance? U processor? 256GB SSD max? Also I am surprised they still only got 8GB of RAM, I mean seriously am I supposed to run my virtual machines on a thumb drive readyboost or what? Beside all of this I am really disappointed that they focus on the screen. I am not the only one who will still be running 1080p resolution because of many reasons (scaling, performance etc.). Not this year, but I was for the past 3 (in fact, I attended CES, MWC and IFA in those years). Decided to skip all the major tech shows in 2014 after being disappointing with the experience/results last year. It’s hard to compete with bigger publications and provide news from the show-floor when you’re doing everything by your own, and I’m not really focused on news any way, as you can tell from my posts. I’d rather get the products for reviews, but I’ll still update on the important launches. That should be Broadwell Core M.
Few things, its not a U, but Y, so it’ll probably end up slower than the 28W Us in the higher end models of the UX301. I think the HD 5300 may end up not too far from the Iris 5100 in the UX301, mostly because the Iris 5100 isn’t much over the U series HD 4400 anyway. Thanks for heads up on that BayTrail mistake, I meant Broadwell of course. I still need to do some catch-up on these new Broadwell CPU lines, I’m not very familiar with the nominations, families, etc. If the 5300 ends-up similar to the 5100, that’s 10-20% on top of the Intel HD 4400. Not bad, but I was rooting for more. Some people from IFA have been reporting that the display is not a touchscreen but CNET claims that it is. Your article also seemed to hedge a bit on this, suggesting that maybe it will have both. Can you clarify this with a post as soon as you get some solid info on the display(s)? There was not touchscreen on the showcased model. 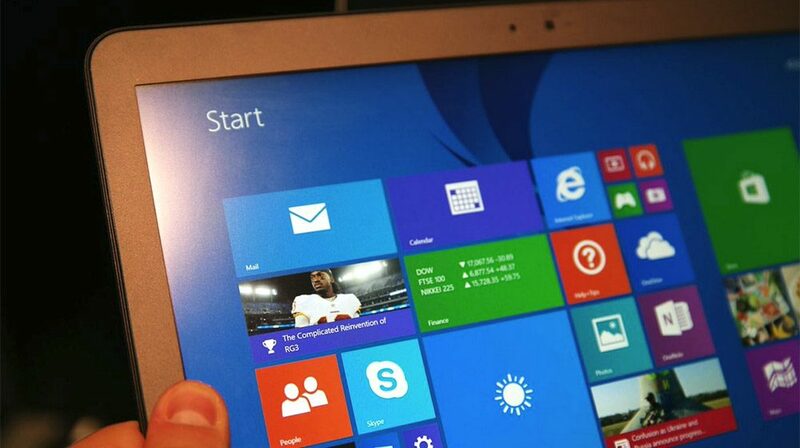 However, final release versions will definitely be available with a touchscreen as well. A similar panel is used on touchscreens for the Asus UX303LN, Lenovo Yoga 2 Pro and Samsung ATIV Book 9 Plus laptops. However, I dop hope Asus will also offer some configurations with non-touch matte displays, like the one on this sample. 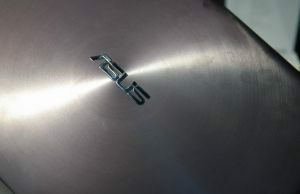 Check asus.com/Notebooks_Ultrabooks/ASUS_ZenBook_UX305/ to see that there’s no non-touch for QHD+. In your post you are saying the keyboard is backlit. I think I read somewhere that it won’t be…only issue I am having with the UX305. Are you sure in this point? I’m not. This post is a summary of all the impressions I’ve found on the UX305 in the last weeks. I’ll double check on the keyboard. Went for an Asus ux303LN now, after they were finally deliverable. I know the little detail of the missing backlit keýboard would have annoyed me…and no longer waiting, including for tests of the ux305’s performance. FYI, Windows Key + Pause Break is the hotkey to open the system screen you went to in the video to look up the ghz. Maybe it can’t be done while holding a camera. Of course it is right on the ASUS website. I just wanted to ask do you think you will be able to replace the battery on the ux305 when it dies? Probably yes, with a bit of effort, but ONLY if Asus will offer replacement batteries down the line. And I’m not so sure they will. I emailed asus and they said that there technicians would be able to replace the battery for 40 to 90 euros plus postage. So how do you use a battery carefully nowadays? I can only tell you what I personally do. 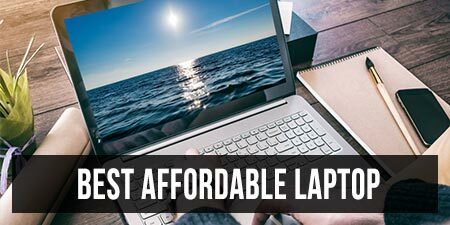 Only charge it to 90% (Lenovo has an utility that allows that) and usually plug it in once it goes below 25%. On top of that, I try to use the computer on battery as often as possible, but once I disconnect it from the plug, I let it discharge past the 25% mark I mentioned before. In other words, try not to keep you laptop always plugged in, and when you unplug it, let the battery discharge before plugging it again. Just be following these simple tips only about 1.5% of my battery’s capacity has wear off in about 180 cycles (the new battery that I got after my old one died). OFC, that’s just what I do and what works for me, others might have different approaches. PS: is that 40-90 + postage + THE actual battery, or is the battery included in that fee? If yes, then it’s a fair price. I paid 150 euro for a brand new original 6 Cell battery for my ThinkPad X220 last year. Hey there again, so there are two versions obsidian stone adn ceramic alloy. Do you think one of those will be more delicate to scratches? Can’t say for sure, I’ll have to see them live first. Do you have any updates as to when this UX305 be available in the USA? Also the Zenbook NX500? :)) Nice, thanks for this. Do you know when the new macbook air retina will come out? No, but since the Broadwell Core U series in scheduled for Q2 2015, I’d reckon no sooner than April next year. Asus when will u listen to your customers! 1- 5Y10a what a mediocrity ? Why not 5Y70??? 3- are you guys making these in someone garage in Taiwan ? Your production needs total renovation ! Why are u sending 15 units to US retailers ??? 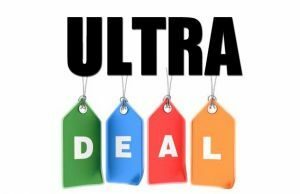 Do you know if they will release a broadwell u version? I doubt they will for this one. But they will update the UX303 series to Broadwell from what I’ve heard, as well as release new models later this year. Should be faster, but at the same time might run even hotter. Not sure what to say about it till I actually get to test one. 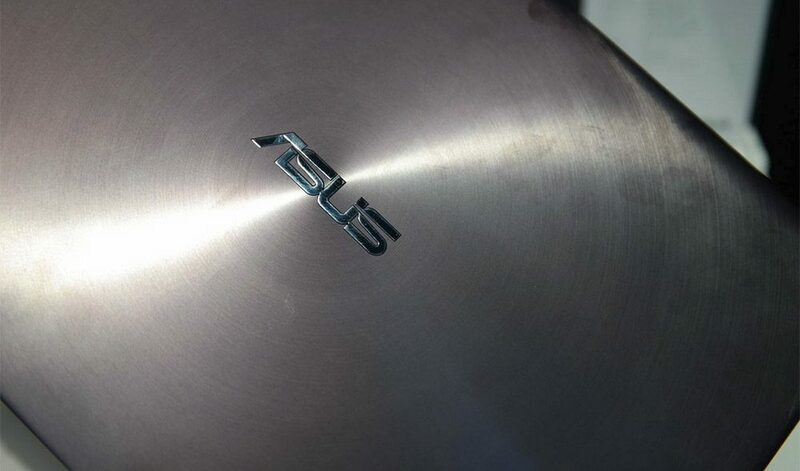 Any update on the ASUS ZenBook UX305FA-RBM1-GD? It is now listed as having a touchscreen and available for a pre-order, with expected release of 5/15/2015. I’ve seen this information on Adorama and B&H. I will order that laptop if it really is going to be released next week. I’ d like to get asus ux305, but I live in SE Asia. Who knows, what country has any shops? Malaisia, Indonesia, Vietnam, Cambodia, Thailand? I need SSD512 and toach screen. I would like to buy this computer, but by looking at the photos of the keyboard, it appears not to have any sort of number pad. I need to be able to make characters used in other languages (e.g., ö, ñ, ¿, ß) easily. I generally use the number pad for the ASCII codes. I can’t find this computer in stores to look at it in person. I am hoping you can help me get some information about it, as I’d prefer to ask an expert source but not the sales source. Does it have a number pad that I wasn’t able to see in the photos? If not, does it have an alternative for such characters? Thank you sincerely! It does not have a NumPad and no other laptops of this size would offer one, since there’s no room to include it. If you need a NumPad you’ll have to go for a 15 inch laptop. You could also buy an external USB powered NumPad for around $10 of Amazon and other stores. Thank you for the information. I currently have a laptop the same size, and it has a number pad that you use by pressing fn + alt. This was standard. Is that no longer the case?? Oh, yes, some laptops offer a virtual NumPad Area the way you mentioned. I don’t think it’s the case with this Zenbook, but to be frank I never tested it. Perhaps someone who already owns it can pitch in here. And thank you for the information about the availability of an external numeric keypad. I had no idea! Some of the comments say the users haven’t been successful using them to make characters with ASCII codes, but I’m sure some do work for this. I read your extensive review before I went ahead and buy one last week. Thank you. My specs are 5Y10 processor, 8GB RAM and 256GB SSD. Everything is perfect (including the its value for money) bar one – battery drain even when laptop is shut down (not sleep or hibernate). Over a period of 8 hours 100% fully charged battery will drop to 85%, consistently. One thing i noticed is even though the ux305 is shutdown, the usb lan port will still light up, suggesting that usb power is not off. BIOS has no such options to turn off usb charging. Ending Asus USB charger + doesn’t help either. Have you encountered such a problem? Thank you. Hi Dennis. That doesn’t sound like something I had to deal with before. 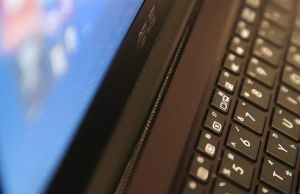 Have you tried disconnecting the LAN adapter while the laptop is asleep (or shut down) and see if that has any impact on battery life? It would help narrow down the issue. There might also be a Wake on Lan option in BIOS you could deactivate, I’m not sure if it’s there on this laptop though, but worth a look. If that doesn’t help in any way, you could then make sure you’re running the latest BIOS updates Asus offers, as well as the latest chipset drivers, etc. You can also look for the UX305 Owner’s Thread on the notebookreview.com forums and ask other owners if they encountered a similar issue and how they fixed it. That’s where I go if I get into something I can’t crack myself. Thanks Andrei for your suggestions. A few days i removed the LAN cable overnight but that did not stop the battery drain. This time I removed all USB devices from the ports including a Microsoft wireless mouse transceiver and hey presto!!! there was close to zero drain!!! Am so glad this is finally solved as i have googled high and low for a few days and found no solutions. Next i need to see if it’s the MS transceiver that’s doing the bad deed and how to stop all usb power when off. Well thank you so much Andrei. Same price? Tough to say, but I’d probably go with the one with the backlit keyboard and full-size ports. Are you sure that’s the UX301LA? isn’t it the UX303LA?